Come hear great local bands like Dead Flowers, Royal Sons, and The Robot Bonfire! Tickets only $10. Doors open at 7pm, show starts at 8pm. See you there! Join us at the Maverick Bar in Carrollton! June 1, 2018 at 9pm. Get more info on the Maverick website. We’re playing 4 sets from 9pm to 1am. See you there! Come see us in Austin Texas this Friday night at the Big Bang Bar on historical 6th street! Make sure to RSVP – space is limited. Notes: SXSW unofficial venue – no wristband required! Come join us for a fun time! 7PM, bring your appetite and ears. 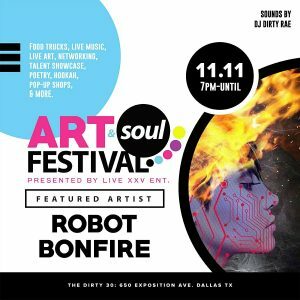 Notes: Art & Soul Festival presented by XXV ENT. 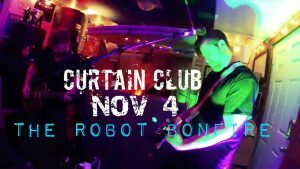 Come and see us at the Curtain Club this Saturday 11/4! 8:30PM is when the fun begins. 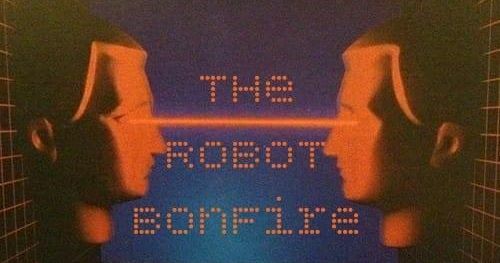 Welcome to the OFFICIAL The Robot Bonfire website! Please listen to and buy our album!